Christmas already seems like a distant memory now that the decorations have been packed away in the loft once again. But before I consign it completely to 2013 history I want to do a quick retrospective round up of what foodie goodies we indulged in over the festivities. My January waistline can confirm that there were indeed many. 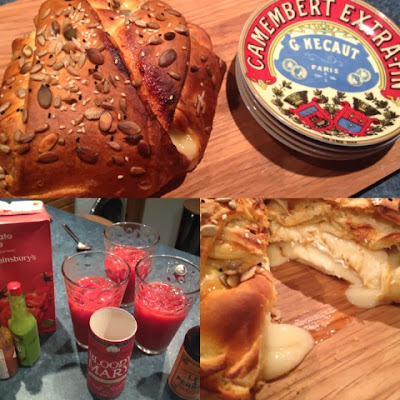 I'm guessing that the Camembert baked in Croissant Dough washed down with Bloody Marys didn't help. But boy was it worth it. To the consternation of some I broke with tradition on Christmas Eve and - shock horror - we didn't have fish pie. 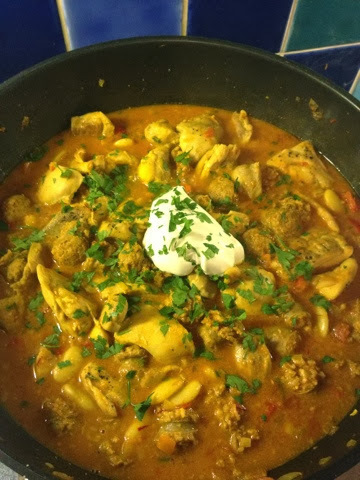 In its place was Saffron Chicken with Chorizo and Butterbeans. Even the skeptics seemed to enjoy this although I wasn't very happy with the chorizo I used and would try to source better cooking chorizio next time. Served it alongside Creamed Leeks and Mashed Potato with Smoked Garlic and Smoked Rapeseed Oil. 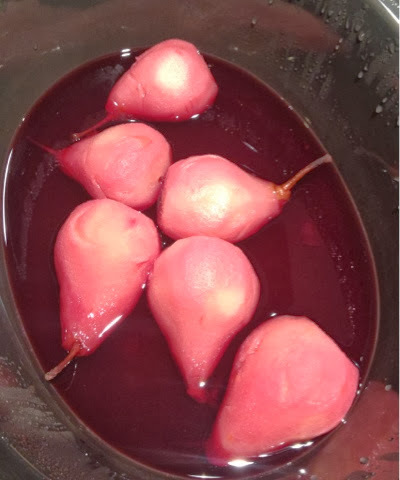 Desert was pears poached in mulled wine in the slow cooker. This was an impromptu change of plan due to an abundance of pears. It worked really well and was very simple to do. Peel pears, place in slow cooker, pour over bottle of mulled wine. Roberts your fathers brother. They should have been served with Ice Cream but someone forgot to buy any. It might have been me. I let Foodie Loon open an early Christmas pressie for the after dinner drinks. 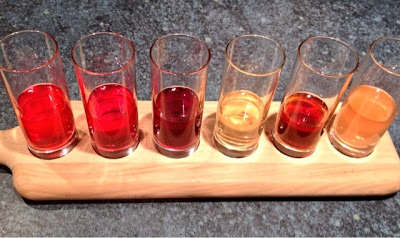 An oak paddle and shot glass set to serve up my homemade booze. From right to left we have Redcurrant Vodka, Bramble Gin, Blackcurrant Whisky, Rhubarb Gin, Christmas Pudding Vodka and Rhubarb Vodka. I'm not quite sure how Santa managed to safely get gifts in stockings after consuming all those. Christmas day breakfast was smoked salmon and scrambled eggs with warm croissants. 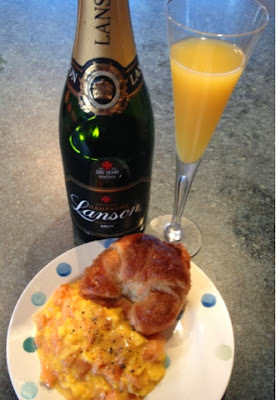 Washed down with the obligatory Bucks Fizz. Top tip for your Bucks Fizz. Splash out on the OJ, skimp on the fizz and add a splash of Grand Marnier or Cointreau. You won't look back. Goose was the star of the show this year and it didn't disappoint. 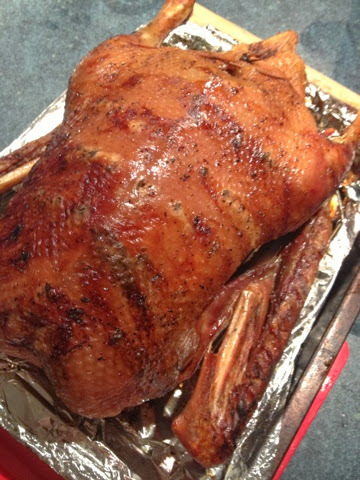 I was really happy with my bird and the flavour was amazing. As I had been warned it did indeed produce a LOT of fat but this was used to cook the roasties and the parmesan baked sweet potatoes & parsnips. 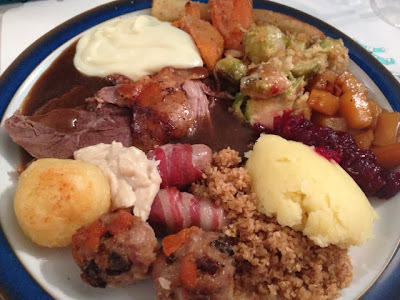 Foodie Mum was in charge of making the gravy with the neck and giblets so nothing went to waste. 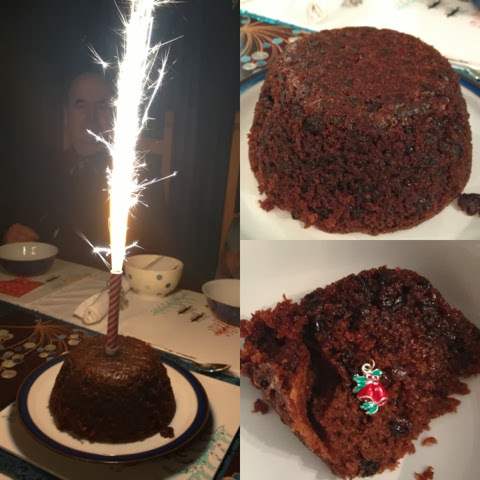 Desert was my Mum's 7 Cup Pudding topped off with a firework and containing much longed for charms. Complaints again about the lack of ice cream. 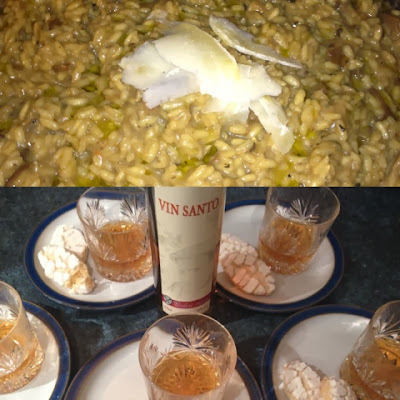 Boxing Day was an Italian feast in an attempt to recapture our summer holidays in Tuscany. Antipasto platter, Risotto with Porcini and Truffle oil, Ricciarelli and Vin Santo and to finish Limoncello & Amaretti Biscuits. We discovered that my Mum definitely does not like Limoncello. But she does like Brandy and Elderflower Tonic Water. It was really nice to eat Italian and have something different than the traditional festive fare. 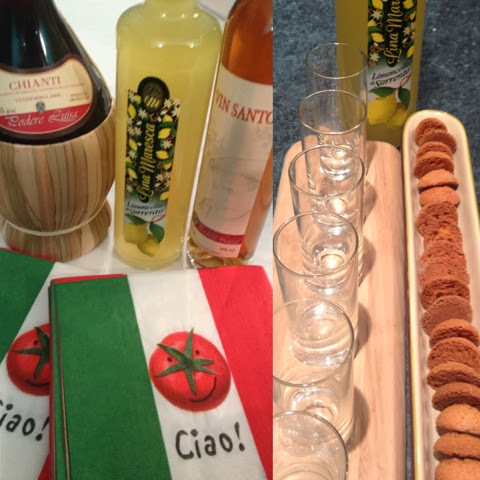 Using almost my entire luggage allowance to bring food and drink home from Italy was well worthwhile. We've booked to spend a fortnight close to Venice this summer and I'm already making my shopping list. 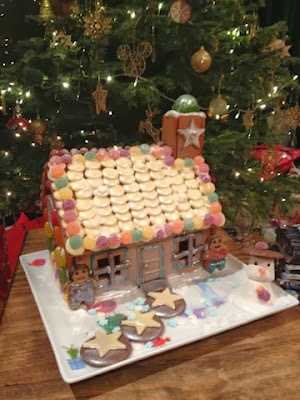 The Gingerbread house was demolished for desert one night. 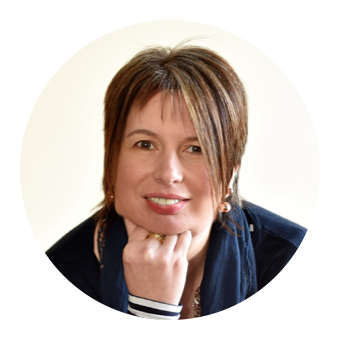 You can read all about it (and its three predecessors) here. We are going to see Hansel & Gretel at Scottish Ballet next week and hoping for inspiration for this years design. 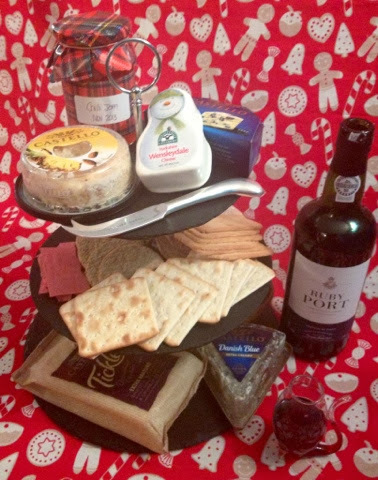 Its just not Christmas without Cheese and Port and both made regular appearances through the holidays. 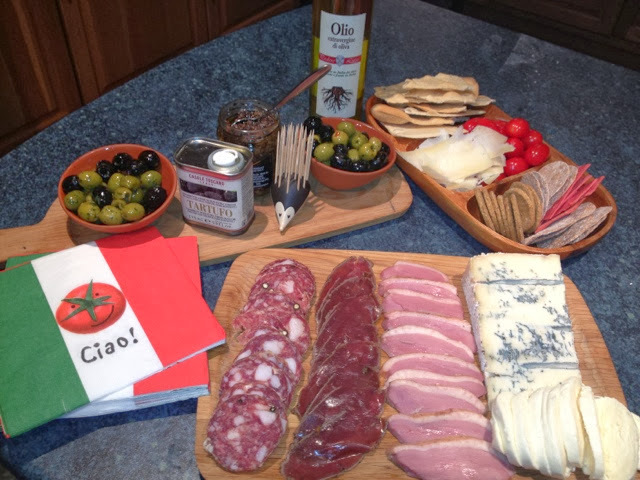 Foodie Sis gave me a gorgeous slate three tiered cake stand which works fantastically well as a Cheeseboard. I may get that much desired Cheese Afternoon Tea at some point after all. Whilst on the subject of drink our Gin collection also grew with the addition of Caorunn and Spiced Orange Edinburgh Gin. 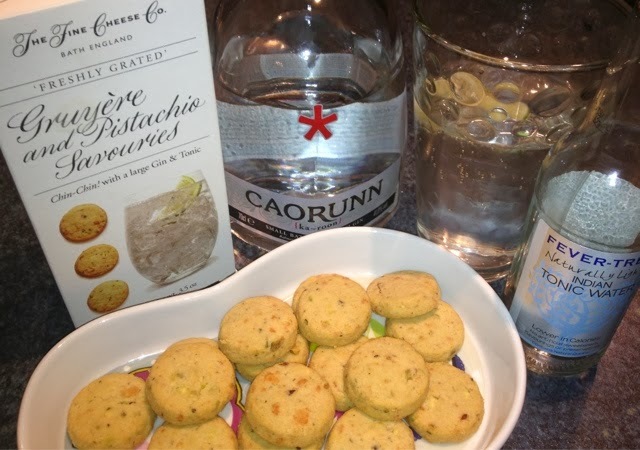 The Gruyere and Pistachio Savouries were recommended to be served with a large Gin & Tonic. It would have been rude not too. 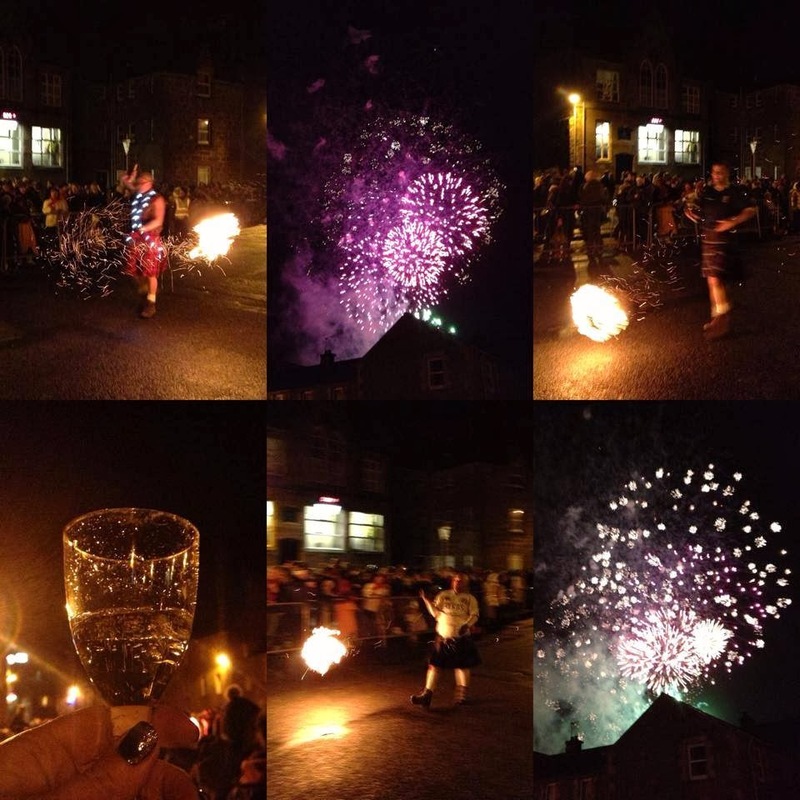 Hogmanay was spent at the Fireballs in Stonehaven. A great night. Definitely a sight worth seeing if you can. 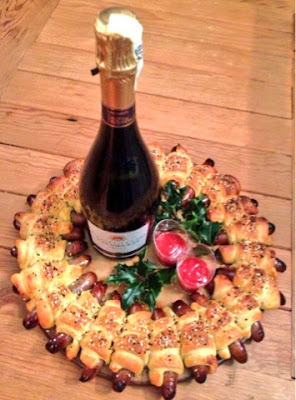 Prosecco and a Sausage and Croissant Wreath to take to a New Year's Day House Party concludes my festive food photos. Hope you managed to Eat, Drink and be Merry. Anyone started planning their food for Christmas 2014?! My word, this is making me hungry! Supposed to be on a post-Christmas health kick, but now I just want cheese and gingerbread..